Hello loves and happy Thursday! Here is yet another fashion post from our stay in Boston. I'm so happy I was able to do this shoot for you as the whole week was filled with snow and icy temperatures. I've wanted to show you this outfit for weeks, but it was simply too cold to wear this beautiful festival style kaftan sooner. Today was simply a great day! Temperatures shot up to 20 degrees and it was like the whole city was celebrating this early summer day. People outside walking their dog in their tees, kids playing in the park eating ice cream. You can just feel the energy and happiness everywhere! Here are some pics of my new lace kaftan by Island Tribe I already got on my previous visit to the States. I really love the length and the flowy-ness and it makes me feel less naked wearing my shorts. Yes I know I'm a bit old school 🙂 The lace is simply stunning and the little fringes give it an extra kick don't you think? 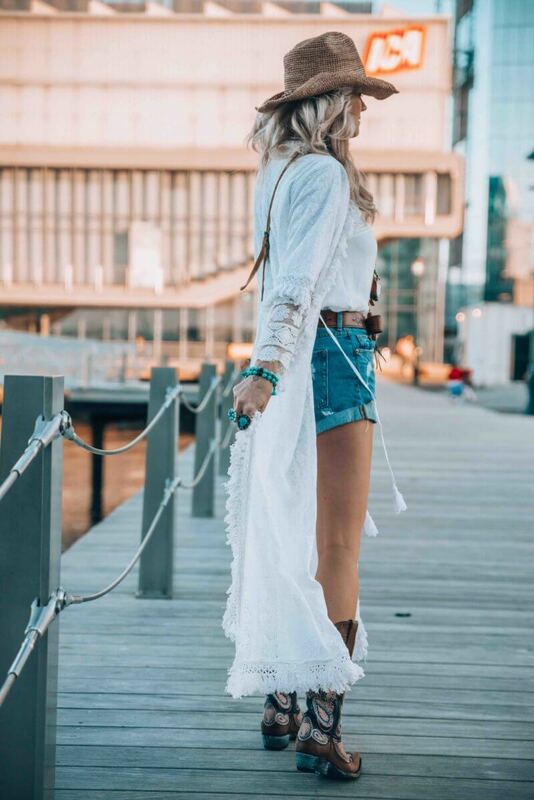 The stunning boots are from Old Gringo. They are super comfortable to wear and the pink details really make you stand out. I have been wearing these boots non stop since I got here and the embroidered details are just amazing. This pair is called The Bell. Anyways, I had a super fun day and enjoyed this crazy little summer day to the fullest. As I'm writing this the first snow is already coming down again. Time for me to start packing again and head back home to Amsterdam ready to take the next plane to Marrakech! So stay tuned for more adventures!